Society of Certified Senior Advisors: The Joys of Travel: older adults are embarking on adventures of a lifetime in unprecedented numbers. The Joys of Travel: older adults are embarking on adventures of a lifetime in unprecedented numbers. Travel among older adults is increasing exponentially. It’s the perfect time in life to embark on new adventures. But there are also many practical matters that should be addressed beforehand. Traveling in later life can be the adventure of a lifetime. It’s never too late. 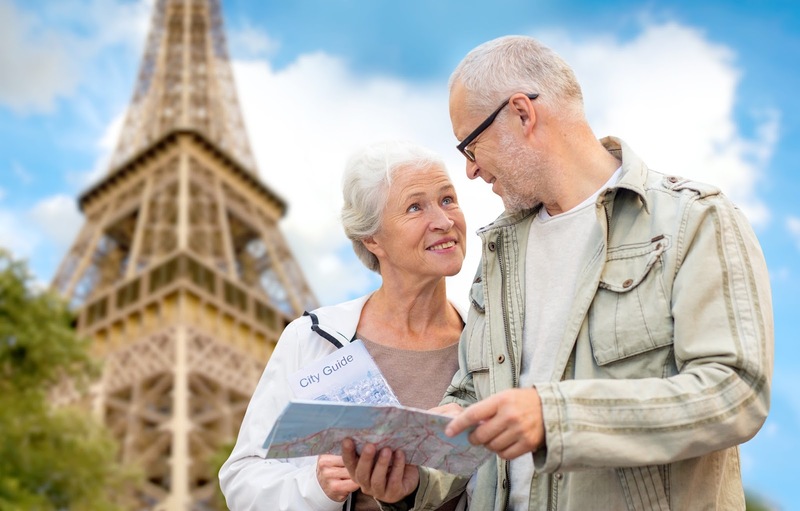 When people reach their retirement age or older, they sometimes stop traveling for many reasons. They don’t have a traveling companion, they move at a slower pace, have mobility or health issues, or just plain cold feet. But these reasons shouldn’t stop them from packing their bags and taking the leap from the status quo. When working with older clients who want to travel but have concerns, it is up to the advisor to be the detective and find out what they might be. Engage them in a conversation about their travel experience—whether on family vacations, road trips, or to other countries. Once identified, create a wish list of their top three things to do or places to see. Include reasons why they want to go, whether they would travel alone or with someone, the type of transportation needed to get there, accommodations, and travel costs. This will be a good start in determining if the trip they want to go on is realistic. Being honest with clients about what they can do is important and will enable them to plan an adventure around places they want to go and things they want to do and see. There are many things people need to consider when making travel arrangements, such as navigating through airport security, seating on the airplane, hotel and room accommodations, transportation from the airport to the hotel, getting around on the cruise ship, shore excursions, and organized tours. Before embarking on the trip, make a list of important items to take. It should include such things as phone chargers, converters, medications, if any, toiletries, and camera. Preplanning and researching destinations and attractions suitable for the individual will also ensure the success of any trip. Know before you go. If traveling outside the United States, passports are required and need to be valid at least six months after the return date of the trip. Some destinations require visas with the costs varying according to the destination. It’s a good idea to research time zones, as well as weather conditions in the travel areas to avoid typhoons, monsoons, or other weather issues. Immunizations may be necessary for travel to certain areas. An excellent information resource is the U.S. State Department’s Passports and International Travel site, which includes a traveler’s checklist. It advises travelers to make two copies of their travel documents, and leave one at home with friends or family, and who to contact in case of emergency. Check out their Smart Traveler Enrollment Program. Cruises are popular vacations for many travelers, including cruise ships, ocean liners, riverboats, paddle wheelers, yachts, and schooners. Each vessel varies in size, number of passengers, amenities, destinations, accessibility, and style. It is a great way to see many places in one trip and you only have to pack and unpack your suitcases once. Cruise ships can carry approximately 900-4,500 passengers with a choice of cabins: inside, ocean view, balcony, and suite. On a ship, the passenger cabins usually start on the third deck to the top of the ship, which could be deck seventeen or higher. There are accessible cabins in each category, depending on the need. Cabins differ in size, floor plan, and location on the ship (front, middle, or back). Cruise ships also offer a myriad of activities that range from very active to sitting in a lounge chair watching the clouds float by. Activities vary from ship to ship, and that information can be found on the cruise lines’ websites or by calling them. The entertainment and dining options on these amazing vessels are as varied as the activities. The modern cruise ship is a vacation destination in itself. Many cruisers like to go on excursions when they reach a port to enjoy the cultural experiences that specific area offers. Passengers can leave the ship by “tenders,” which are usually the ship’s life boats used to shuttle people to and from the land dock, if the ship is anchored away from the shore. Passengers using wheelchairs can get off at a port by an accessible walkway from the ship. However, not all ships port where there is a walkway. The cruise line can advise about this. River cruises in Europe have become very popular over the years because they are smaller in size, and carry fewer passengers. These cruises stay further inland while cruising the Rhine, Maine, Danube, and Elbe, allowing for beautiful views of the countryside while on board. River cruising has a variety of unique activities, such as glass blowing demonstrations, local dancers and musicians, storytellers, and wine pairing talks. Each cruise highlights the food and wine of the featured culinary area they are sailing through. Meals are included and most often the shore excursions as well, specifically focusing on the town where the ship is docked. The accessibility of these boats varies and may not be the best choice for wheelchair users. The cruise line will need to be contacted for better direction. Some of the popular brands in Europe are AMA Waterways, Viking River Cruises, and Avalon Waterways. There are many cruise options in the U.S. as well. Modern paddle wheelers ply the Ohio, Mississippi, Cumberland, Snake, and Columbia rivers, offering relaxed, historical perspectives of our country. The cabins are spacious, the food is delicious, and the cruise schedules are plentiful, though seasonal. Two of our domestic cruise lines are American Cruise Line and the American Queen Steamboat Company. Vacations by rail have become popular for many reasons—it’s a great way to see the country and not be the driver. As you sit near a window, order your food, and enjoy the ambience of the scenery passing by or engage in the conversation with other passengers. There are different room types within the train ranging from the traditional coach to the smaller sleeper cars (roomettes) and the family sleeper car. Make reservations well in advance to get the one you want. Currently, Amtrak offers people age sixty-two and older a 15 percent discount on the lowest available rail fare on most Amtrak trains. There are limitations, so visit the website or call them. Using the rail system in Europe is an outstanding way to travel. Rail Europe offers those over the age of sixty discounted rates. The discounts offered are on certain passes and specific trains. These senior rates are generally on first-class travel only. There are many types of tours available for the traveler. Scheduled tours have specific travel dates, itineraries, minimum and maximum number of passengers required for the tour, and they take care of any visas required if traveling to more than one country. Themed tours are becoming quite popular, such as culinary, wineries, heritage, or religious travel. For those who want a more flexible schedule, customized trips can be planned. This gives the flexibility of staying in a destination longer, visiting places that are of more interest, and maybe have the option of traveling by different means. A customized trip could include a private guide to take travelers to out-of-the way places a tour bus isn’t scheduled to go. It also allows for spur-of-the-moment travel changes. If traveling with people similar in age is important, then a senior group tour is the best choice. Some tour companies have organized trips but may not go to many destinations. An alternative is to get a group of friends who want to travel to the same place, and plan a customized trip. The destination, activity level, accommodations, and excursions will be tailored to what the group wants. Adventure travel can mean many things from mountain climbing, cycling tours, scuba diving, as well as volunteering. One of the best known organizations that provide educational travel tours primarily geared to older adults is Road Scholar, formerly known as Elderhostel. Alongside local and renowned experts, travelers experience in-depth and behind-the-scenes learning opportunities, from cultural tours and study cruises to walking, biking, and more. The nonprofit offers 5,500 educational tours in all fifty states and 150 countries. From America’s National Parks to Bar Harbor Music Festival in Bar Harbor, Maine, to the Galapagaos or Machu Picchu, Road Scholar has an adventure ready. Elder Treks, the world’s first adventure travel company designed exclusively for people fifty and over, is another resource worth investigating. Volunteer vacations, sometimes called “voluntours” or “service learning tours,” offer the opportunity to give something back while traveling, whatever your skills or interests. Ken Budd’s article in AARP Magazine (2010) offers a thorough overview of this kind of travel. 1. What kind of work do you want to do? 3. How long do you want to stay? Carefully consider all aspects of your trip before you decide, and be clear about just how adventurous you want to be and what kind of experience you want to have. For travelers with physical disabilities or health issues, the tour operator can advise as to whether or not a particular tour is appropriate or whether the hotels they use are appropriate. Again, depending on the circumstances, a customized trip might be a better option. Travel agencies can help make arrangements for accessible travel. Look for websites that have the ADA (Americans With Disabilities Act) symbol or talk about accessible travel. Special Needs at Sea has a list of travel professionals who are Certified Special Needs Advocates. Preplanning and researching destinations and attractions suitable for the individual will also ensure the success of any trip. Should medical equipment or special arrangements be necessary, they can be handled by a travel professional months prior to the trip. Special Needs at Sea is one of the preferred companies travel professionals use, as they are dedicated to offering services such as sand wheel chairs, oxygen services, transport chairs, and so on. Traveling is an investment, and it is advised to purchase travel insurance to protect that investment. Some of the coverages include lost luggage, flight delays, missed flights, medical expenses, and trip interruptions. The amount of coverage varies and the premium can vary depending on the company. Some premiums are based on age and some on trip amount. Airlines offer travel insurance for flights, but if a trip includes a cruise, tour, or excursions, the airline doesn’t offer total coverage. Insurance to cover everything is available through Travel Guard, www.travelguard.com, or Travel Insured at www.travelinsured.com. Many travel professionals have access to travel insurance as well. One important thing to know about travel insurance is that replacement of lost items are paid for by the traveler, who then files a claim with the insurance company for reimbursement. Health insurance from one country is not accepted in another, including Medicare. Travel insurance offers medical benefits, for various coverage amounts. If medical assistance is needed, the claims department should be called and they will help find a doctor or medical facility. They can even arrange for transportation if necessary. They will work with the medical facility on payment. Finding companies that offer travel options is plentiful and overwhelming. There are things to consider when choosing a company for your trip. Make sure they are reputable. Just because they have a web presence and you can talk to them on the phone, doesn’t mean the company isn’t based in Canada or another country operating under foreign regulations. The best place to start is with referrals from friends and family. The services of a reputable travel professional can offer advice on companies or tours of interest, suggest alternatives that might be more favorable, help with flights, travel insurance, and be the personal liaison for the entire trip. Don’t forget about websites for various tourism boards that offer information on a given city, region, or country. Sharon Sloane is the owner of Continuum Travel Agency, LLC, in Greenwood Village, Colorado. She is a Certified Special Needs Advocate specializing in accessible travel. Contact her at sharon@continuumtravelagency.com, 303-771-3044, or visit www.continuumtravelagency.com. The Joys of Travel was featured in CSA Journal 63.